Ambrose comes back again and unloads with right hands. Ambrose sends AJ to the floor and goes to the top but Baron Corbin’s music interrupts and out he comes. Ambrose watches him march to the ring. AJ recovers on the floor and also looks on. We go to commercial. Back from the break and Corbin has joined commentary. AJ works over Ambrose in the ring and hits a backbreaker. Corbin and Miz argue on commentary as AJ keeps control. Ambrose finally counters but has Dirty Deeds blocked. AJ unloads with strikes and hits a swinging neckbreaker. Ambrose comes back with clotheslines. Ambrose goes for a superplex but AJ slides out and drops Ambrose into the turnbuckle face first. More back and forth. Ambrose rolls Styles up for a 2 count. AJ with a kick.. Ambrose dumps AJ to the apron. AJ goes for the Phenomenal Forearm but Ambrose knocks him to the floor. Ambrose runs the ropes for a dive but AJ nails a forearm. AJ goes for the Phenomenal Forearm but Ambrose catches him coming in. They block signature moves but Ambrose slams AJ on his back for a close 2 count. AJ comes off the second rope but Ambrose catches him in mid-air. AJ turns that into a 2 count. AJ drops Ambrose over his knee and covers for another 2 count. AJ ends up going for the Styles Clash but it’s blocked. They trade pin attempts. AJ connects with the pele kick but Ambrose comes back with the Lunatic Lariat and they both go down. AJ ends up on the floor again. Ambrose goes to the top and nails the top rope elbow to the floor. Miz tries to come in but Corbin stops him. This distracts the referee while Ambrose is covering for the pin. Ambrose comes over and takes out both Corbin and Miz. Ambrose goes back to AJ but Styles catches him in the Styles Clash for the non-title win. – After the match, AJ quickly has his hand raised before leaving the ring. Miz enters the ring and picks Ambrose up for a Skull Crushing Finale. Miz drops Ambrose on his face and stands tall. Corbin grabs Miz from behind and hits End of Days. Corbin drops Ambrose with End of Days next. Corbin’s music hits as he stands tall over Ambrose. 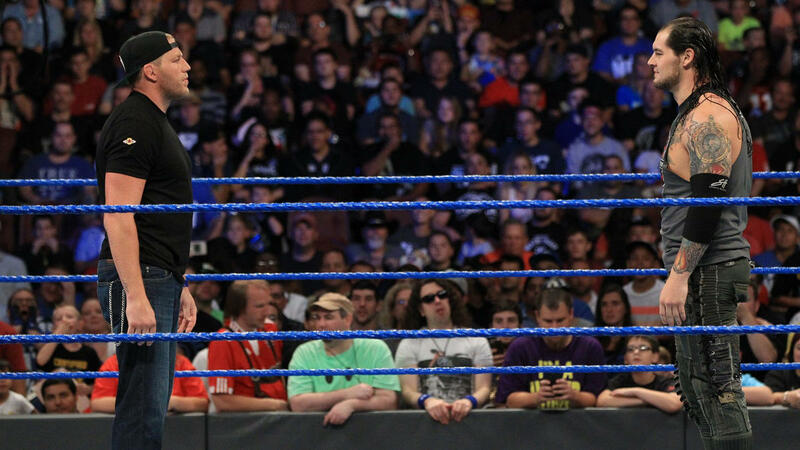 SmackDown goes off the air with Corbin staring Styles down. 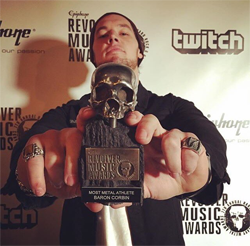 Baron Corbin is #13. Corbin joins the alliance against Strowman, but Strowman suddenly eliminates Dillinger. Zayn hits Strowman with the Helluva Kick, and Corbin follows up with a clothesline over the top for the elimination. It’s now Zayn, Ambrose, and Corbin in the ring, and I think Jericho is still legal somewhere on the outside as well. Kofi Kingston is #14. Kingston drop kicks Zayn and goes for an elimination, but Corbin attacks them both from behind. Ambrose drives his shoulder into Corbin’s gut in the corner, but Corbin regains control and tries to eliminate Ambrose. The Miz is #15. Kingston gets launches at the ring post but hangs on and pulls himself back in. Sheamus is #16. Sheamus levels Miz, Corbin, and Ambrose in rapid succession. Miz eats White Noise and Zayn gets a scoop slam. Sheamus pounds on Miz and Brogue Kicks Jericho. Corbin and Ambrose try to dump Sheamus, but Sheamus rolls back into the ring. 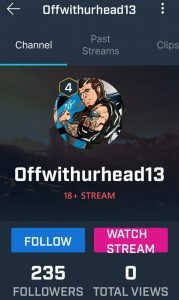 Big E is #17. Big E spanks Miz, and yes, that’s something I hoped I’d never have to type. Kingston and Big E go after Miz as Ambrose and Zayn trade elimination attempts. Rusev is #18. Rusev splashes everyone standing and levels Sheamus with a spin kick. Rusev tries to dump Zayn, but Zayn lands on the apron and scrambles back into the ring. Rusev goes after Ambrose as Kingston and Big E double team Corbin. Cesaro is #19. Cesaro hits Jericho with a spinebuster and then swings Jericho followed by Zayn followed by Ambrose followed by Kingston followed by Big E. Corbin gets swung and Sheamus tries to beg off, but Rusev saves Sheamus with a super kick. Xavier Woods is #20, and now all three members of New Day are in the match. New Day triple team Miz but can’t manage to eliminate him. Bray Wyatt is #21. Wyatt side slams Jericho and connects with a back elbow shot to Zayn. Wyatt faces off with Woods and levels him with a clothesline. Woods and Kingston end up on the apron, and Cesaro and Sheamus try to eliminate them. Apollo Crews is #22. Big E pulls Woods and Kingston back into the ring, but Cesaro and Sheamus hit a 2-on-3 clothesline to eliminate all three members of New Day. Cesaro and Sheamus have thoughts of eliminating each other, but Jericho sneaks up behind them and eliminates them both. Randy Orton is #23. Orton power slams Miz and RKOs Corbin. Orton RKOs Rusev and then catches Zayn with a mid-air RKO. Orton goes after Jericho as Wyatt goes after Ambrose. Dolph Ziggler is #24. Ziggler super kicks Wyatt and Crews. Ziggler goes for a leaping DDT on Ambrose, but Ambrose counters into a near elimination. Luke Harper is #25, and now all three members of the Wyatt Family are in the match. Harper quickly eliminates Crews before staring down Orton. Wyatt tries to rally the troops, but Harper clotheslines Wyatt and big boots Orton. Harper goes for Sister Abigail on Wyatt, but Orton makes the save with an RKO. BROCK LESNAR IS #26, and business is about to pick up. Lesnar eliminates Ambrose and Ziggler before hitting Rusev with a German suplex. F-5 to Orton, and Lesnar is the only man standing in the ring. Enzo is #27, but he thinks better of charging into the ring to face Lesnar. Enzo finally picks his moment and charges at Lesnar, but Lesnar drops him with a clothesline and dumps him for the elimination. Lesnar suplexes Rusev as Jericho again rolls out of the ring to catch a breather. GOLDBERG IS #28! GOLDBERG SPEARS LESNAR! GOLDBERG ELIMINATES LESNAR!!! Goldberg clotheslines Corbin and jackhammers Zayn. Wyatt and Orton double team Goldberg, but he levels them both with a double spear. THE UNDERTAKER IS #30! Taker appears in the ring, and he stares down Goldberg. Taker goes for the choke slam, but Corbin and Rusev attack Taker and Goldberg. Goldberg eliminates Rusev as Taker eliminates Corbin. – We get a video warning from Baron Corbin as he prepares to face John Cena tonight. – Baron Corbin is backstage with a promo on how tonight will be the End of Days for John Cena. WWE Champion AJ Styles walks up. He says tonight is Corbin’s night. AJ’s music hits as he heads out to join the announcers on commentary. The WWE Champion makes his way out to a pop as we go to commercial. Back from the break and Noam Dar plugs WWE 205 Live. 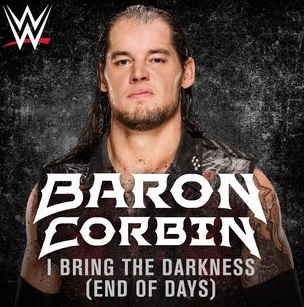 We go back to the ring and out comes Baron Corbin. John Cena is out next to a pop. They stall some to start but Corbin strikes first with a big boot. Corbin works Cena over and taunts AJ. Corbin tosses Cena out to the floor and stands tall as we go back to commercial. Back from the break and Cena tries to power up but he collapses and Corbin goes back to work on him. Cena fights back on the floor but Corbin hits him with a bunch of elbows against the barrier. Corbin brings Cena back into the ring but wastes time by talking trash to AJ. Corbin enters the ring but Cena dumps him back to the floor. Cena jumps off the apron and decks Corbin. Corbin fights back and charges but Cena moves and Corbin crashes into the steel steps. Corbin turns it back around and hits a big powerslam for a 2 count. Cena makes a comeback but Corbin catches him in Deep Six for another 2 count. Corbin talks some trash and Cena fights back. Corbin catches him in a bear-hug now. Cena makes a comeback and hits the tornado DDT out of the corner. Cena keeps control and hits the Five Knuckle Shuffle. Cena nails the Attitude Adjustment for the win. Baron Corbin joins the show and reaffirms his intentions that he made earlier in the evening about his entrance in the Royal Rumble. Corbin says he’s part of the reason SD Live won the ratings last week since he was in the main event. He says he’s looking through John Cena and ahead to the Rumble. Corbin piggy-backs off Styles’ promo as Cena being a part-timer. Corbin says Cena can’t beat him with only half his eggs in the WWE basket. Corbin says he will make the kid Cena fans cry next week. He says he’s the number one superstar on the show and he plans to make a point in his Cena match next week. He says Styles’ time will come to an end soon, but Cena’s time ends now. Baron Corbin joins the show. He says Bryan must be mad that he is beating up on all the little guys. Bryan says Kalisto got some shots in on Corbin as well, but Corbin dismisses as him taking his time picking him apart. Bryan asks the camera man to zoom in on Corbin’s eye, which is sporting a minor shiner. Corbin goes into a Dean Malenko comparison with fans cheering for Kalisto. Corbin says he should now be in the main picture. Bryan says everybody deserves an opportunity, but Corbin laughs it off as everyone getting a participation trophy. Bryan finally says Corbin put in a great performance and is in consideration to be put in main event picture. Corbin says he’ll do whatever he has to, to get into the main event. Corbin drops the mic as he heads out to celebrate his victory. When American Alpha leaves the show, The next topic of conversation is Baron Corbin. How he cost Smackdown Live the cruiserweight division. Bryan calls Baron Corbinselfish. Daniel feels that The Cruiserweight Division is underutilized on Raw and that Smackdown Live would have been the prefect home for that division. Renee agrees with Daniel. Bryan puts over Rich Swann’s background. Says that most people only know about his dancing. Bryan talks about How Swann’s mom and dad died when he was a young man. How he lived alone when he was a teenager…. Bryan says that he couldn’t even make himself a sandwich when he was 15 years old. He says that Rich Swann got into the drug culture when he was a teenager, and what saved him from that lifestyle, was pro wrestling. Bryan calls Rich an incredible human being. Bryan talks about how close, he got to all the talents in the division. Bryan then talks about how being small works against you in the business. How Raw doesn’t do a good job of getting the audience to know the cruiserweights personally. Bryan talks about how this is a star driven business. How fans buy to see stars not just great matches. How the talents in the cruiserweight division, need to be focused on for their backgrounds and personalities. Bryan gets back to ripping on Baron Corbin. How he is out for himself. Baron Corbin joins the show. Corbin goes right after Bryan verbally. Takes issue with Bryan punishing him, by pitting him against Kane. Then criticizes Bryan for allowing Kalisto to interfere in his match.. Bryan calls out Corbin for his hypocrisy. How he has done the same exact thing. Bryan tells Corbin, that he cost SD Live, The Cruiserweight Division. Baron says that he did the show a favor. Says “Why do you want those little kids here”… Doing flips and tricks… Corbin says that people at home want to see stars like Goldberg, Lesnar and himself rather than the cruiserweights. Corbin says that kids at home don’t want to be like the cruiserweights… Daniel responds by saying, that when he was a kid. He wanted to be Dean Malenko. Bryan says that he looked up to Dean because he could do things that Hulk Hogan and Goldberg could never do. Bryan says that he identified with Dean more than those other stars. Daniel goes on to say that The WWE isn’t just “One size fits all”…. Corbin disagrees. That it is one size fits all. How if you put “little kids” in the ring with him. How he dominates them. Bryan disputes Corbin by telling him that Kalisto at only 5’3, beat him up on Smackdown Live. Bryan books Corbin vs Kalisto in a chairs match at The TLC PPV. Corbin says that he is going to get paid to repeatedly hit Kalisto with a chair. Corbin tells Bryan to be prepared to call Kalisto’s parents after he beats him badly. To tell them, that Kalisto is coming home for good. Corbin walks off the set…. Bryan tells Renee that Kalisto is the one who requested the Chairs match vs Corbin backstage. Says that Kalisto idiolized Rey Mysterio and wants to prove himself… Bryan goes back to defending the cruiserweights. Says that they are not just about flips. How Kendrick and Drew Gulak are mat wrestlers and the wrestlers who do “the flips” are all great athletes….. Bryan admits that Baron Corbin is a dangerous man and realizes that he can do serious damage to Kalisto, but that he has a lot of heart and believes in him. Baron Corbin is welcomed in as the first guest tonight. Bryan and Renee mockingly clap for him. Corbin doesn’t seemed too pleased with this gig. Renee asks Corbin why he refused AJ’s offer to team with him on Smackdown. Corbin says why does he need a partner. He spent his whole life playing team sports. Teammates only hold you down, Corbin proclaims. Renee asks him why he would refuse to be in the main event. Corbin says he was already in the main event a few weeks back when he beat up the former WWE champ Dean Ambrose. Daniel Bryan then brings up Baron Corbin’s elite athletic background. Former NFL player. Former Golden Gloves Boxing champ. Winner of several jujitsu tournaments. Bryan asks is that why he prefers to do things by himself. Corbin agrees with that. He says he relies only on himself. Talks about being a 3 time golden gloves champ and fighting all over the world. Daniel Bryan serves up a kayfabe softball and asks Corbin if he is so confident in his abilities. Why does he keep attacking his opponents from behind and before matches?… Corbin says today was his birthday and he felt like giving himself a birthday present by attacking Apollo Crews tonight. Renee asks Corbin how he feels about Jack Swagger. Corbin says people make stupid decisions everyday. How he is not worried about Swagger when he faces him. Renee asks who made the stupid decision, Swagger or Smackdown management. Corbin sarcastically says Daniel Bryan is doing a good job. Mocking him for throwing out the first pitch at baseball games rather than focusing on his talent. Bryan says what have you done to earn opportunities. Corbin says he has earned them by laying everyone down. Bryan says Corbin didn’t look like he was interested in laying down Jack Swagger on Smackdown by walking away from him. Bryan touts that Swagger is an All American wrestler. Corbin says that won’t do him any good. Dolph Ziggler is also an all American wrestler and he couldn’t beat Corbin. Renee defends Daniel Bryan and the job he has done. Renee asks Corbin if he is willing to be a team player. Corbin says write me a check and i’ll do what you ask me to. Corbin says he is all about winning championships and making money. Renee asks Baron what do you think is your biggest obstacle. Corbin says it’s the decision makers and the people who make the matches. Bryan says Corbin got a shot against Dean Ambrose. Corbin says he beat him. Bryan says it wasn’t by pinfall or submission. Corbin says that it was because of a 5 foot 7 kid kicking him. Bryan then asks Baron if he thinks he can beat AJ Styles. Corbin says he can beat anyone put in front of him. Renee asks Baron about the return of John Cena. Baron says everyone is the same. He doesn’t care who it is. He then states that he has all the tools to be the world champion and if anyone is in the WWE without that mindset. They shouldn’t be there. Corbin says that he beats people up for a living and he loves imposing his will against others. He gets great joy out of that. Bryan says that if Baron wants to prove himself. He needs to stop attacking people and beat them in the ring. To which, Corbin says he already beat Crews sunday. Why does he need to beat him again on Smackdown Live. Bryan says that you have to consistently win to earn more chances like he did in his career. Corbin reiterates that is only out for championships and that he didn’t need to beat Crews tonight. Leaving him laying on the ground was good enough for him. Renee thanks Corbin for coming on the show. As he leaves, Renee asks Bryan why everyone has so much hostility towards him. Renee thinks it’s because Bryan is the face that represents Smackdown Live. Corbin works on the arm and Ambrose with a side head lock. Corbin with a shoulder tackle. Corbin with forearms to Ambrose and then he punches Ambrose in the ribs. Corbin with a knee to the midsection. Ambrose with a cross body and he punches Corbin. Ambrose clotheslines Corbin over the top rope to the floor. Ambrose with a clothesline off the apron. Ambrose slams Corbin’s head into the announce table. Corbin grabs Ambrose on the apron but Ambrose drops Corbin across the top rope. Ambrose with a missile drop kick and he follows with a running forearm and then Corbin sends Ambrose into the turnbuckles on a bulldog attempt. Corbin with a Northern Lariat and then he punches and kicks Ambrose. Corbin sends Ambrose over the top rope as we go to commercial. We are back and Corbin stands over Ambrose and then he applies a quarter nelson and chin lock. We see footage from the commercial break when Corbin Irish whipped Ambrose into the ring steps. Ambrose with elbows but Corbin with a forearm. Ambrose bounces off the ropes but he grabs Ambrose by the throat and hits an STO choke slam and gets a near fall. Corbin returns to the quarter nelson and chin lock on Ambrose. Ambrose with punches. Corbin with a knee and Ambrose with an Irish whip but Corbin slides to the floor. Corbin goes for a clothesline but Ambrose ducks and hits a swinging neck breaker and both men are down. Ambrose with punches. Corbin with a knee and Ambrose with a kick and he sets for the double underhook DDT but Corbin runs Ambrose into the corner. Corbin goes for a shoulder in the corner but Ambrose moves and Ambrose with a near fall. Corbin with a clothesline. Ambrose with a forearm and Corbin fires back and Dean bounces off the ropes and hits a clothesline for a near fall. Ambrose goes up top and Corbin with a forearm to stop Ambrose. Corbin sets for a superplex but Ambrose blocks it and Ambrose with forearms to knock Corbin to the mat. Corbin charges at Ambrose and Ambrose drops down and Corbin goes over the top rope to the floor. Ambrose with a suicide dive and he sends Corbin back into the ring. Corbin with Deep Six for a near fall. Ambrose goes to the floor and Corbin follows. Corbin sends Ambrose into the ringside barrier. AJ gets up from the announce table and he tells Corbin to finish him. Corbin argues with Styles and Ambrose sends Corbin into Styles and then Ambrose with an elbow from the top turnbuckles for a near fall. Styles gets on the apron and Corbin with a rollup for a near fall. Dean goes for the double underhook DDT but Styles with an accidental round kick to Corbin and the referee calls for the bell. After the match, Ambrose with a pescado onto Styles. Styles and Ambrose fight on the floor but Corbin hits Ambrose from behind. Corbin and Ambrose return to the ring and Ambrose with a double underhook DDT. Styles goes for the Phenomenal Forearm but Ambrose crotches him and then Ambrose shakes the ropes.